Your opinion matters. 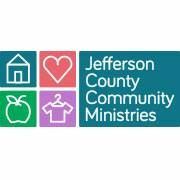 Leave A Review Or Edit This Listing for Jefferson County Community Ministries. The Food Pantry solicits, stores, and distributes food for the community as referred to it by the JCCM office. Some of the funding received by JCCM is used to purchase additional food and to provide adequate supplies for cleaning, personal hygiene, and baby products for distribution to the community. JCCM also receives U.S.D.A. commodities. All food pantry applicants are first interviewed at the JCCM office. Food for emergency situations that arise outside of the regular operating hours can also be provided. The Food Pantry can assist up to 3 times in a 6 month period. We always need more information on our pantries. If you know of any details, volunteer information, website, hours or more description information about Jefferson County Community Ministries please add a comment (below the map on this page), with information. We will then display this for all visitors on this page.